No more is a blog just a single page with a "what I did at the store today" kind of dialog. Blogs are the lifeblood of the Internet, bringing publishing to the masses. Gone are the days of individual page creation to post an entry, too. With WordPress you can have enterprise-level content management capabilities for your blog and Website, for the same cost as the air you breathe: Free! So what the heck is WordPress, anyway? WordPress is a Web-publishing platform frequently used for Web logs, or "blogs", that focuses on speed, ease of use and one of the best user experiences available. With WordPress, you can manage anything from a simple personal site with just a few pages all the way up to a commercial site with hundreds of pages. The sky is the limit with WordPress, and thanks to that ease of use, it doesn't matter if you're a Web expert or just getting started. Anyone can create a fantastic website using WordPress. WordPress is an Open Source project, which means there are hundreds of people all over the world working on it. (More than most commercial platforms.) It also means you are free to use it for anything from your dog's home page to a Fortune 500 website without paying anyone a license fee. Started in 2003, WordPress has become the largest self-hosted blogging tool in the world, used on hundreds of thousands of sites and seen by tens of millions of people every day. If you don't already have WordPress installed on your hosting account, see Install WordPress. After WordPress is installed and you get the email from us telling you that everything is ready, it's time to log in to the WordPress Dashboard for the first time. Open your Web browser of choice and go to the domain name where you installed WordPress. For example: http://mycoolnewblog.coolexample.com (mycoolnewblog.coolexample.com is the domain name you used to set up WordPress). 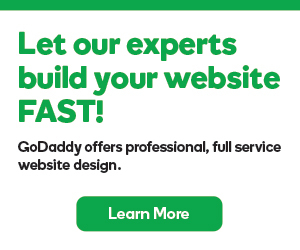 If you already have WordPress set up elsewhere, see Moving Large WordPress Sites to GoDaddy for more information.